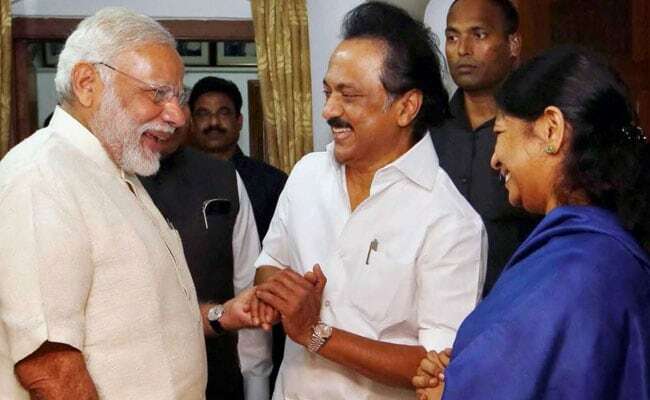 As Prime Minister Narendra Modi met DMK patriarch M Karunanidhi on Monday, social media was abuzz with speculations that the BJP had made the first move to rope in DMK as an ally for the 2021 Lok Sabha elections. PM Narendra Modi had visited Mr Karunanidhi at his Chennai home on Monday. Chennai: Tamil Nadu's opposition DMK has denied that its postponement of the scheduled "Black Day" protests against demonetisation in eight districts of the state has any link with Prime Minister Narendra Modi's visit to its ailing patriarch M Karunanidhi. The DMK had called for a statewide protest today along with all 18 opposition parties -- which had joined the Congress-led protests against PM Modi's shock announcement of ban on high denomination currency on November 8 last year. But yesterday, it postponed protests in Chennai and seven other districts. The party's working president and Mr Karunanidhi's son MK Stalin today said the reason was rains, which had crippled life in Chennai and adjoining districts last week. "It is wrong to attribute this to Modi visiting Karunanidhi," said Mr Stalin. "It was a courtesy meet, not a political meet. He met Karunanidhi out of respect and mutual regard," added Mr Stalin, who led the protests in Madurai. Mr Karunanidhi's daughter, Ms Kanimozhi, led the protest in Coimbatore, other senior leaders of the party had been stationed in other parts of the state. On Monday, PM Modi who was in Chennai for two private functions, surprised many by visiting Mr Karunanidhi at his residence. The 93-year-old leader, who has been recovering from respiratory illness, has made very few public appearances in the last one year. Social media since has been abuzz with speculations that the BJP had made the first move to rope in DMK as an ally for the 2021 Lok Sabha elections. Many say the AIADMK, which is seen as a natural ally of the BJP, would not be a safe bet due to weak leadership and poor performance. A DMK leader who did not want to be named, said, "Roping us in as an ally would no doubt help the BJP, but our party is not interested. Interestingly, no one can say what Modi did is wrong, as it is a fine gesture by him". On Tuesday, Mr Karunanidhi's elder son MK Alagiri, who's no longer with the party, thanked PM Modi for visiting his parents. In a letter, he had said, "Your personal visit and invitation to stay with you will rejuvenate their health. I deeply appreciate your vision and commitment to take the country to greater heights".